Beautiful and rare ref 16528 Zenith Daytona from the 1990’s. 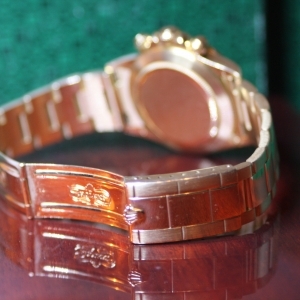 The watch condition is very good, it has the original ‘old style’ gold bracelet on full length. The original tritium dial and hands are undamaged, the overall condition could be considered as very good. The Rolex Daytona is one of the most sought after Rolex watches, especially the zenith models are increasing in price. The steel models are at the same price level as the gold examples, this was totally different a few years ago. As the worldwide demand on Daytona watches is extreme these full gold examples are getting scarce. this model made in the 1990’s features the famous Rolex caliber 4030 based on the Zenith el Primero. Early examples of the Rolex Daytona have a so called’ inverted six; dial and slim hands. Also the bracelet on early models is slightly different with a more ‘vintage’ looking clasp. We are proud to offer this Rolex watch, please let u know if you want to receive high resolution pictures or more information. We ship worldwide and trade in timepieces as well. On request it’s possible to deal through the chrono24 platform who offers a trusted checkout service. Click here for information about this service, customer reviews and our current listings. Besides 1 year guarantee and the original box the watch is accompanied with the Daytona booklets and catalog from 1992.